This Place of Worship was founded after 1995, and we understand it is still open. This building appears to post-date my Derbyshire Street Atlas of 1995 - it is not marked on there. It is listed in Places recorded by the Registrar General under the provisions of the Places of Worship Registration Act 1855 (2010) with a congregation of "Christians Church of God". To find out more, you may wish to visit the website of their parent organisation, the Churches of God in England. Now or formerly Church of God. 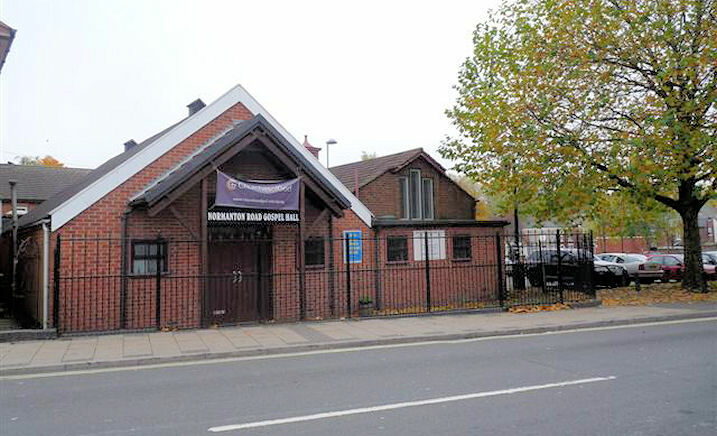 Normanton Road Gospel Hall, Derby shown on a Google Map. Information last updated on 14 Dec 2018 at 15:14. Please also remember that whilst the above account may suggest that Normanton Road Gospel Hall remains open and accessible, this may not remain so. This Report was created 26 Mar 2019 - 18:57:48 GMT from information held in the Derbyshire section of the Places of Worship Database. This was last updated on 6 Feb 2019 at 15:49.